Last week, just as the Northeast Behind the Braids Tour was arriving in New York City, Wendy’s Public Relations department released the company’s most direct response yet to the Campaign for Fair Food. And yet somehow, with more than three years to come up with a plausible defense since the Wendy’s campaign began in earnest in 2013, the recalcitrant hamburger giant still managed to swing and miss…. badly. If you haven’t read it yet, be sure to check out our point-by-point rebuttal to the Wendy’s missive here. But beyond the particular half-truths and clumsy attempts at innuendo that permeated the Wendy’s statement, this kind of move can really only mean one thing: Wendy’s is feeling the heat. 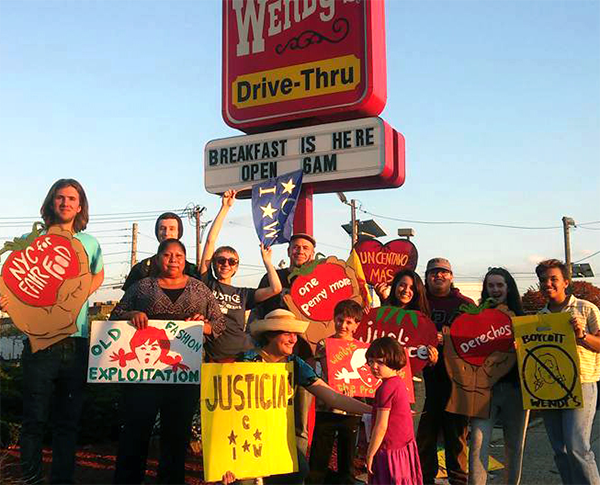 With six regional Behind the Braids Tours this fall alone, word of the Wendy’s Boycott is spreading fast on college campuses, in communities of faith, and in towns and cities across the country, and Wendy’s can’t shut out the growing chorus for real farm labor justice forever. The Northeast Behind the Braids tour started off with a bang in New York City! The Lower Eastside Girls Club of New York, whose support of the CIW’s organizing stretches back to the Taco Bell boycott days, organized a lively march from their community center through Tompkins Square Park and the streets of Manhattan’s Lower East Side all the way to the Wendy’s in Union Square, packed with pedestrians on a busy and sunny Saturday afternoon. 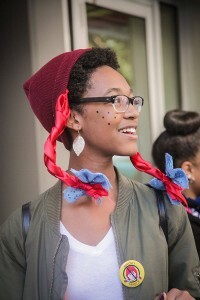 The girls had prepared for the CIW’s visit not just with handmade boycott banners and signs, but also with stylish braids and freckles, similar to the fast food chain’s iconic redhead. Even in the buzzing streets of New York City, the march made a big splash with the indomitable energy of the girls’ boycott chants and drums. Hundreds of New Yorkers passing by received flyers and word of the national Wendy’s Boycott. 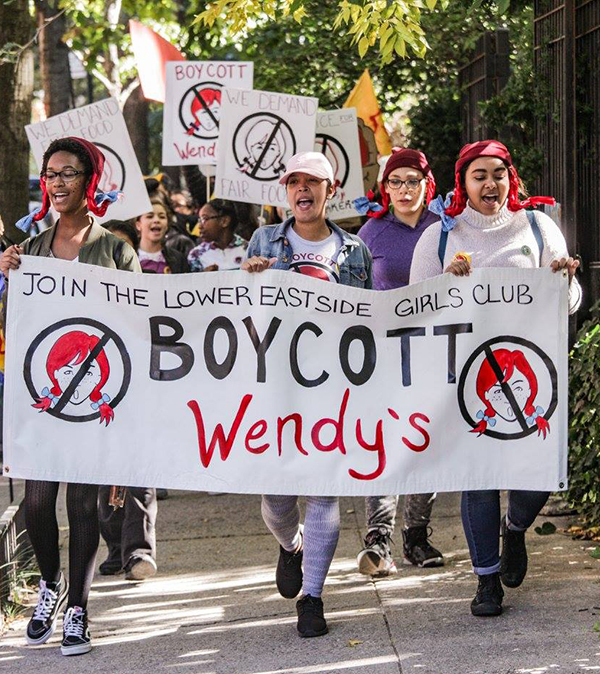 In spite of the infectious spirit of the city’s young girls, the delegation to the Wendy’s manager was rejected, and both CIW members and the young New York residents were promptly instructed to leave the premises. Meanwhile, just an hour upstate, a burgeoning group of allies in the Hudson Valley area joined together for a multifaith action at a Wendy’s in Nanuet, New York. 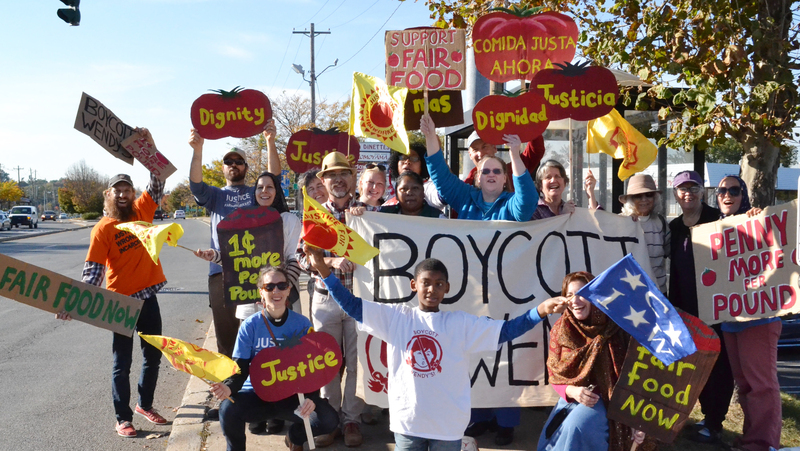 The Multifaith Community at Stony Point Center and members of local Presbyterian Churches, which are part of the Hudson River Presbytery, hosted Lupe Gonzalo of the CIW for a presentation about the Boycott, and the group then caravanned up the road, ready to take action! At the protest, hundreds of passersby stopped to listen as members of Muslim, Jewish, and Christian community members proclaimed that one uniting, central theme of their respective traditions is a call for worker justice. Yet, even in the face of this beautiful and respectful coalition, we were threatened with arrest and not allowed to speak when a delegation approached the Wendy’s manager. Undeterred by Wendy’s stunning disrespect for farmworkers, faith leaders and even schoolgirls, the Wendy’s Boycott movement continued to spread over the course of the following days, with thousands in Upstate New York catching coverage of the protest on Channel 12 and hearing about Fair Food at White Plains Presbyterian Church involving members of the Presbytery, the AFL-CIO, and WESPAC Foundation and presentations with Manhattanville students and high schoolers at the School of the Holy Child. On Monday, the CIW headed to Montclair, New Jersey to meet up with the brand-new Montclair Fair Food Alliance, a vibrant new Fair Food group launched by students from Montclair High School, Montclair State University and Passaic Community College, congregants from local synagogue B’nai Keshet, and other community leaders. The group held a protest at Wendy’s on the busy Bloomfield Ave, a thoroughfare for New Jerseyans heading home at the end of the workday. During the small but spirited action, a group of workers and allies entered the store to try to speak with a manager — and, much to their surprise, were directed to three regional executives, who were seated inside the Bloomfield, New Jersey restaurant for a quiet meeting. Breaking with the pattern of the two previous actions, two of the regional directors listened to Lupe’s powerful testimony and counter argument after counter argument to Wendy’s recent excuses for refusing to join the Fair Food Program. After listening without interruption, both to CIW and to local students about the movement is growing in Montclair, the regional managers respectfully received the group’s letter. 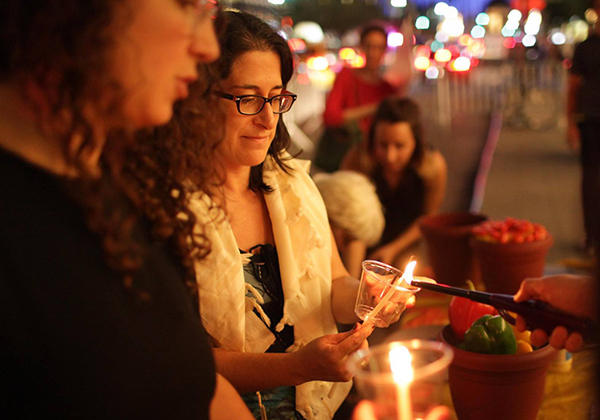 The CIW’s stop in New York City concluded with a powerful vigil on Wednesday night in front of the offices of Wendy’s Board Chair Nelson Peltz. 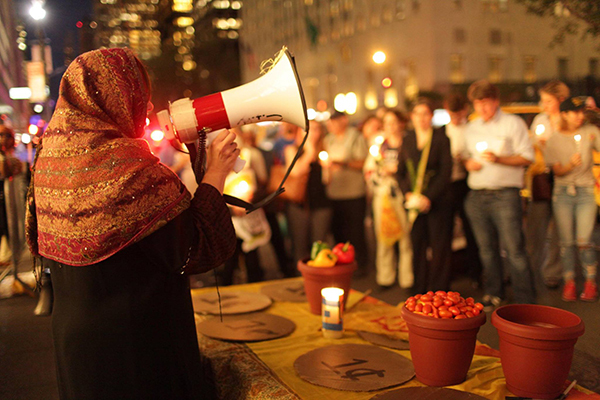 In this hallowed stretch of sidewalk, where the Wendy’s Boycott launched earlier this year, religious leaders from all around the New York area gathered to “set the table of justice” — starting with an altar in the middle of the financial district. After prayer and opening from Rev. Betty Tom of Mt. Vernon Presbyterian Church and Rev. 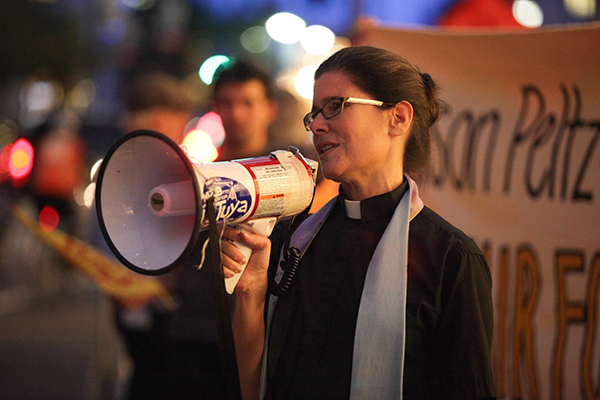 Noelle Damico of the National Economic and Social Rights Initiative (pictured above), dozens of faith leaders gathered shared songs, held candles, and wrote down their own personal hopes for Mr. Peltz and Wendy’s, which were to be delivered at the end of the vigil. Members of Jornaleros Unidos carried produce and pennies to the table to represent the incredible gains of the Fair Food Program. 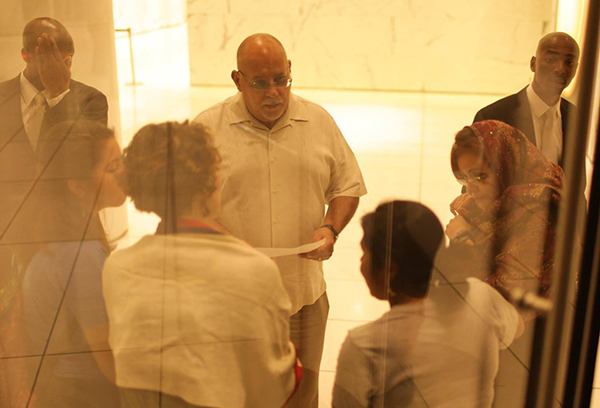 Meanwhile, New York City Fair Food supporters listened as farmworker leaders and religious leaders responded directly to the statement freshly released by Wendy’s just that morning. 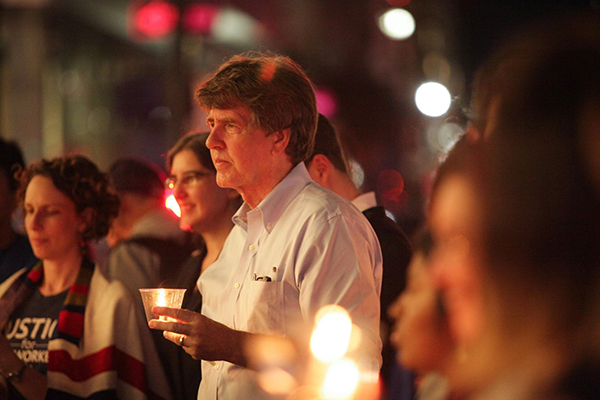 As all waited in silence outside, the messages the vigil participants had written down for the company’s leadership were then carried inside by the CIW and allies. A security guard did not allow farmworkers to speak directly with Mr. Peltz, but agreed to attempt delivery of the messages. That’s it for now from New York, but be sure to check back soon for much, much more from the Campaign for Fair Food trail, including an update from the Boston/Providence branch of the Northeast Behind the Braids Tour and a report from the James Beard Foundation’s Leadership Awards ceremony last week!